The Plantagenet kings of England were fanatical about hunting. William the Conqueror designated vast swathes of the country as forests, with laws to protect the game, and brought over from France his favorite beast of the chase, the fallow deer, with strict orders that only royalty be allowed to hunt it. Special enclosures to conserve the fallow deer were established by King Henry I, and the animals flourished in these deer parks - he made one in his forest of Kank at his royal manor of Sutton Coldfield. Fallow deer flourished under these conditions, and by the time King Henry passed his manor of Sutton to the Earl of Warwick (1125), deer were plentiful enough for top barons to be allowed to have their herds. The 1125 deed specifies that the Earl could have Sutton Park and eighteen fallow deer. In the next centuries deer parks proliferated as a status symbol for the nobility, but after the terrible plague of 1369 (the Black Death) some fell into decline. In 1433 Sutton was still supplying the Earl of Warwick’s table with venison, but Sutton Park was leased out. Matthew Smallwood, the Earl of Warwick's proctor, then had “the farm of the park at £7 6s. 8d per annum for 21 years, that being the tenth year, by deed under the seal of the Earl of Warwick dated January 28th 1 Hen VI (1423), reserving sufficient grazing each year for the wild beasts there”. The “farm” or “herbage” of the park was a form of tenancy, and the value of the rough pasture and woodland products more than repaid the tenant for his rent. In 1480 Richard Lee paid the King’s bailiff £8 for the “herbage of the park”, and in 1528 Lodovic Wyndwood paid £11. In 1528 ownership of the park passed to the corporation of the newly created royal town of Sutton Coldfield. The town’s benefactor, Bishop Vesey, got rid of the deer and the forest laws and fenced off the woodland so that most of the park could be used for grazing, and he stocked the park with cattle and horses for the benefit of the inhabitants. The town still paid the King £11 a year for the herbage of the Park, but with Bishop Vesey’s improvements it was worth much more. 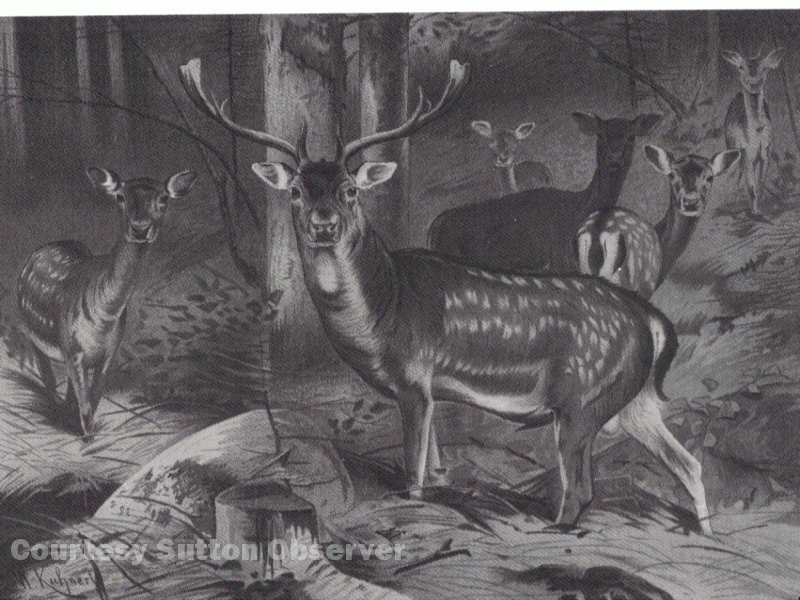 Illustration of fallow deer from The Royal Natural History, 1894.